MELBOURNE, VICTORIAN AND AUSTRALIAN Player and Coach, whose record of achievements may never be equaled let alone surpassed. David Went began his baseball career with the Melbourne Baseball Club in the early 1950’s as a 16 year old and by 1954 had established a regular place in the club’s senior team. David was a a high quality infielder, initially at shortstop and then at third base. He was an integral part of a very successful era for the club, one of a number of players in the senior team at the team who acheived a state representation. During his playing career David played in two Division 1 premiership teams with Melbourne, 1967 & 1969 as playing coach and then a premiership as a non-playing coach on the 1971 team. He represented Victoria during the period 1962 – 1968, playing in 3 national championship winning teams. In the years between 1962 – 1965, David represented Australia. David ceased playing on a regular basis in 1971. This all took place against the background of David having sustained a serious head injury early in his career, necessitating him to wear a batting helmet, long before they became compulsory. David also managed his involvement at club, state and national level whilst bringing up a family of four children and also setting up his own business, KCD Fasteners which still continues to operate successfully today. In 1967 David was appointed coach of Melbourne, a position that he held uninterrupted until 1984. This coaching position incorporated all levels within the club – Junior and Senior. In David’s period as coach the club won three Division 1 Premierships. In 1974 David was appointed Victorian State Head Coach and held this position until 1984. During David’s period as Head Coach, Victoria won 4 Australian Championships and was runner up on 6 occasions. In 1971 David was appointed as Assistant Manager of the Australian team, a position held for 2 years and then for the next 10 years was manager (Head Coach) of the Australian team. During his period with the National Team, David toured the following countries for International Championships: South Korea 6 times, Japan 6 times, USA 3 times, Canada once, Holland once, Italy once, Philippines once. In 1981, David became the first Australian Coach to obtain Level 3 Coaching Accreditation. Prior to achieving this accreditation, David had conducted 80 hours as an instructor at level 1 & 2 Baseball Accreditation courses. Not only was David heavily involved in the playing side of baseball, he was also active in the administration of baseball. He was a member of the Melbourne Baseball Club committee for 21 years, and also a member of original National and State Coaching Accreditation & Technical Committees. He was responsible for design and implementing Coaching Accreditation Courses. On an individual basis in 1974, David undertook two weeks of personalised instruction with the Cincinnati Reds professional baseball team at Spring training. A two week tour of leading American Universities and Colleges, studying their baseball programs. The majority of time being spent at Miami University with Coach Ron Frasier and at Claremont College with Coach Bill Acre. Both coaches had been involved with U.S.A. national teams and were highly respected. In the period 1971 – 1984, David had maximum participation in lectures as well as many hours of personal discussions with all visiting U.S.A College and professional coaches. These included: Chuck Brayton - College, Bob Shaw - Professional, Jack Stallings - College, Charlie Lau – Professional, Red Adams – Professional, Monty Baskell – Professional, Guy Welman – Professional. In addition to the above there were many hours of technical discussions with Japanese and Korean coaches during National Team tours. In May 1975, David participated in a national seminar for sport coaches, organised by the Australian Department of Tourism and Recreation and the Australian Sports Council in Melbourne. Approximately 20 hours of sport science. 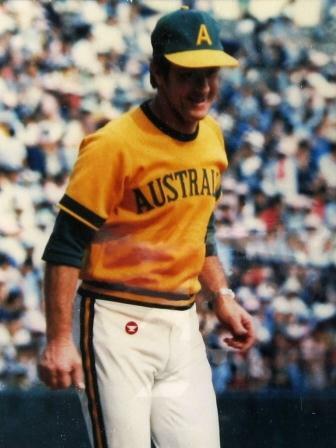 During 1979 – 1981, in an effort to introduce a more professional approach into Baseball coaching, david participated and successfully complete a two year Graduate Diploma of Sports Science with Honours, at Rusden State College, Victoria, comprising Sociology of Sport, Exercise Physiology and Anatomy, Biomechanics of Sport, Skill Acquisition, Sport Psychology, Sports Injuries, Theory and Practise of Coaching, Administration of Sport. All projects completed in this course were of a baseball context. After graduating, David participated as a guest lecturer for subsequent intake... In 1981 David participated in the first World Sports ... conducted in Ottawa Canada. Since then, he has continued to be a supporter of the club, attending past players' functions and currently he is on a sub-committee in relation to the club's 125th anniversary celebrations. His nomination for the Hans Ebeling award is probably long overdue in part being caused by a number of factors that existed in the 1980's after the Baseball Sections readmittance to the MCC after some time going it alone, and by the time David's nomination was being considered, it was sometime after his active involvement with the Section. The years rolled by but the regard that David was held in by the Baseball Section resulted finally in his nomination for 2012, he is a most worthy recipient of the award. 2000 Australian Sports Medal for Australian Sporting Achievement.